Cormorants can be easily confused with the anhinga, but are a more social bird. You’ll see them hanging out in groups. The anhinga prefers solitude, and has a longer, leaner frame. Its neck looks enough like a snake that “snakebird” is a colloquial name for the anhinga. 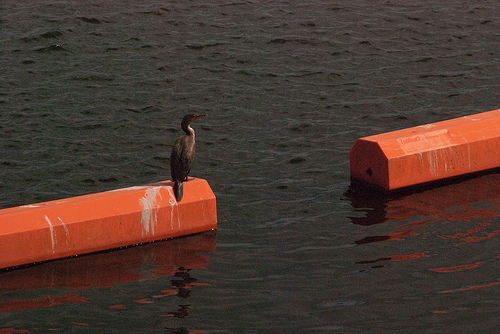 Cormorants do not have the same long necks. Both birds dive underwater for prey and then retreat to a perch to stretch their wings to dry, since they do not have oil glands to waterproof their feathers.